Andrew Ebersold isn’t quite an Eagle Scout yet. 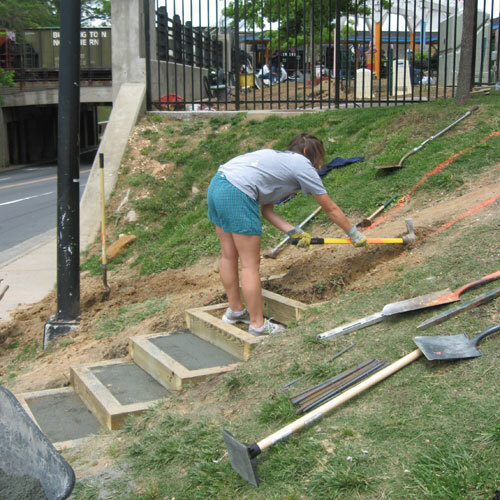 He still has a few more hurdles to clear, including finishing his service project, building steps up the slope to the Center. No denying it though – Andrew has done the Eagle Scout program proud with his excellent work so far. The problem was a serious one. When the new building was built, it made the already steep and eroded slope in front of the Center even more of a hazard. 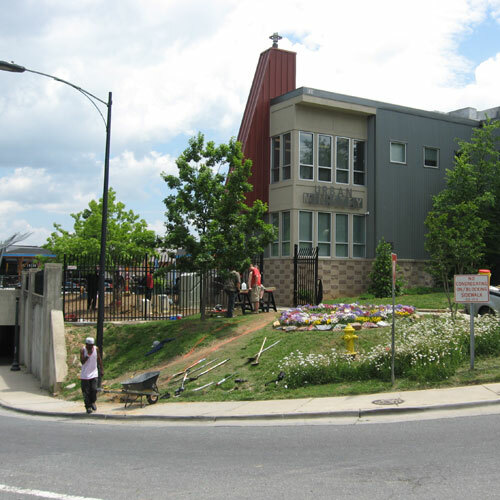 To get to the Mens’ Shelter nearby, homeless neighbors climbed laboriously up the steep hill. In rainy weather, it became a slippery danger, especially to older neighbors who might fall and break a hip or stumble into the path of trucks and traffic on North Tryon Street. 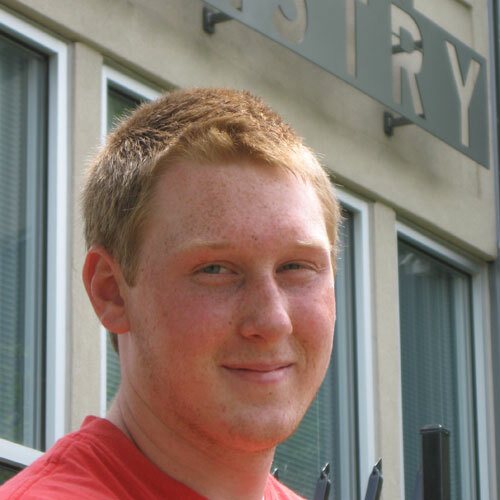 Andrew researched different solutions to the problem, and settled on a sturdy, simple, and environmentally-friendly non-paved set of steps, similar to ones at a nearby school that have held up well for several years. With friends and family helping, he started work in May, with completion targeted for early June. We’ll post more pictures, as the work continues. 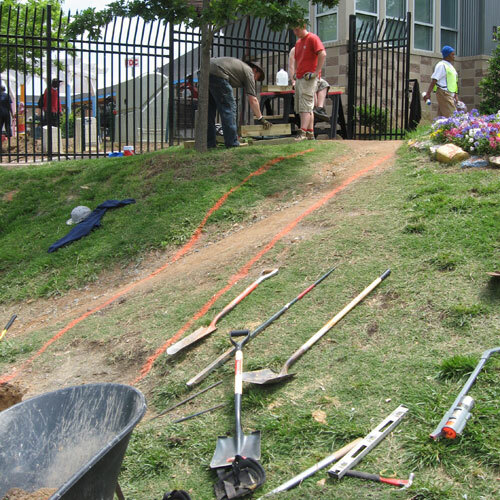 We are using rubble to create all kinds of garden art, edgings, sacred spaces – you name it. Here is one way we get color to the chunks of concrete and riprap, featuring a local group as they work their way through the process. 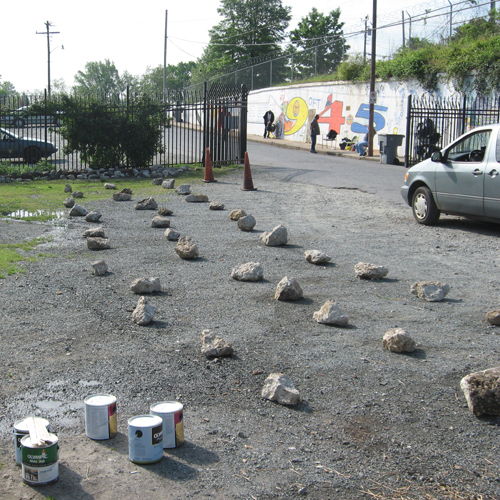 The next step was to work painting the stones. The chunks are decorated using simple, not-toxc paints. Everybody can join it. 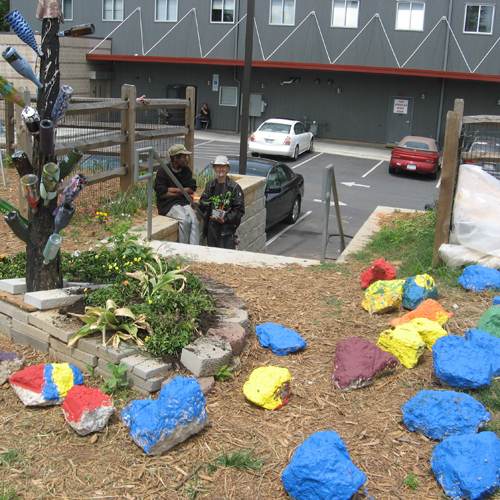 And here is the staging area for the garden, with big colorful rocks suitable for improvised garden uses. Writers and gardeners both need rhythm in our lives, an underlying structure. In spring, the garden song wins. So, finally, I’m going to make myself write a bit now, after a month plus of silence. And when I’m done, I’ll go down in the basement and stick some sweet potatoes into buckets of moist soil mix, so they can start sprouting for planting out next month. And I’ll post a couple of pictures, too. I figure if I blog regularly every day for a week, we can get caught up here. Our big news – a Rodale grant for a real rain harvesting system – will be a high priority. Here’s one of our bright spots, New Dawn roses in full song. I’m going to have to move them later this year when we move the fence, but for now I’ll just enjoy them. 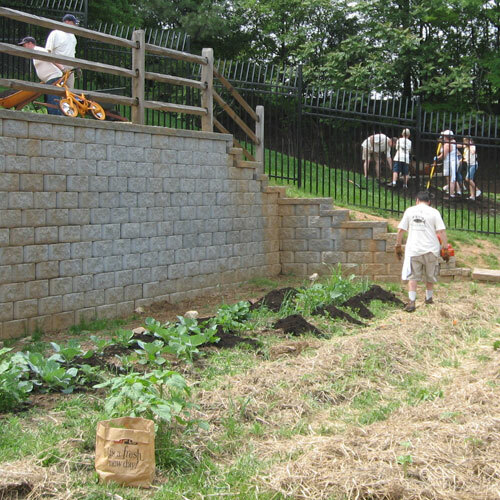 The news beyond that is that our Eagle Scout Andrew is busy building steps up the front, and our garden has given us a wonderful harvest of lettuce (gobbled down in one sitting, but that happens when you feed 200-300 people). We also have lovely strawberries. Kids from Trinity School have come and planted out the tomatoes they helped us grow from seed. All kinds of volunteer sunflowers are blooming. Here’s a photo gallery of people who’ve been helping, beginning with Cleo and her friend, who is taking a couple of our tomato seedlings off to his camp. Paul Hanneman of the Center does what he does very well, telling a volunteer group about the The Center while broadening their understanding of the complexities of social class, poverty and injustice. 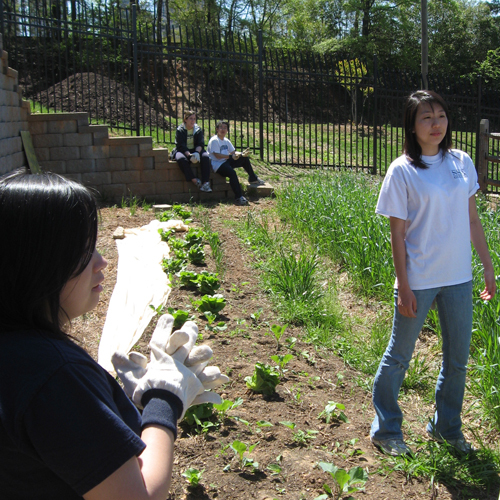 University students make a big contribution to the spring/summer garden through their volunteer work. 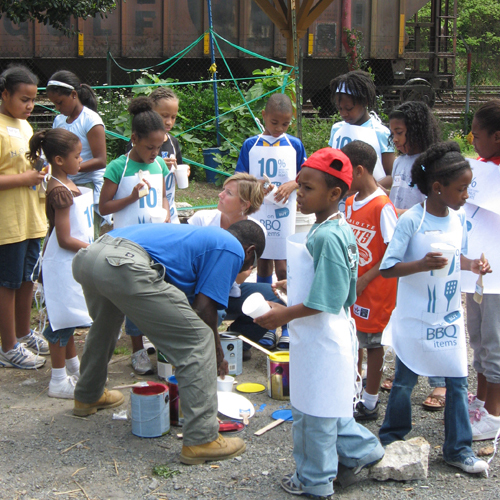 So do groups from businesses, civic organizations, and schools. The weather is becoming warmer and warmer, though nights are still cold. There is a guarded optimism in the air, but a weariness with winter. We’re getting rain, though more would be nice for the garden – not so much for people who still have to sleep under bridges and in the woods. Here’s an image to make anyone smile, Nathan and Cleo sharing something out beside the medicine wheel. Here’s another view of how the wheel looks these days – a long way from those first pickax blows and painted rubblestones. The red tulips just opened this week. Another wheel view, this time with a wider perspective. We have intended to have the wheel in a setting of wildflowers, but they got weedwhacked again by a volunteer landscape crew. Something we need to deal with, but at least they didn’t whack the wheel. Lawn addiction is about as bad a crack addiction here, at least in terms of its ability to get people to turn their brains off. The vegetable garden is still resting, mostly – though under those covers lettuce and cabbage are growing. The tall rye cover crop will be cut this coming week, and turned under about April 1. The planters in the middle area are finally filling up with the pansies that have lurked since November, livened up by daffodils that have volunteered for another year. With spring beating on our door, and the rains coming back (at least for now), this is an even better-than-usual time to volunteer. Here’s Brian, part of our newly forming guerrila gardening force, who will be helping at the Center as well as spreading the word about environmentally sound urban food growing. The group is just now forming, drop me an email if you have an interest. Another option is to come work on a Saturday, usually in the morning from about 9 to about 12:30. This is a group from Davidson College Presbyterian Church. Maybe they were inspired by their excellent basketball team, but they certainly did a lot o work this past weekend. 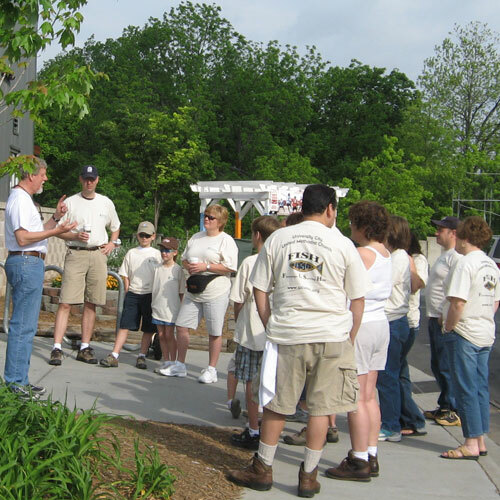 Saturday teams, usually a group of 6 to over 30, are most often from the same church or civic group. 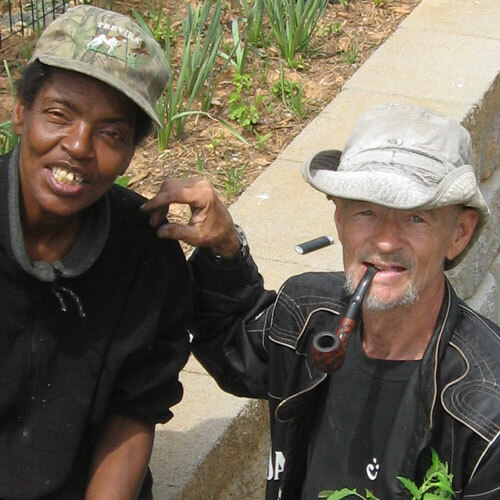 It is equally important to accomplish the task and to talk with and befriend neighbors (our homeless clients). In fact, our ministry of presence is key to what we do here. The volunteers from the two pictures above are from First Methodist Church of Charlotte. 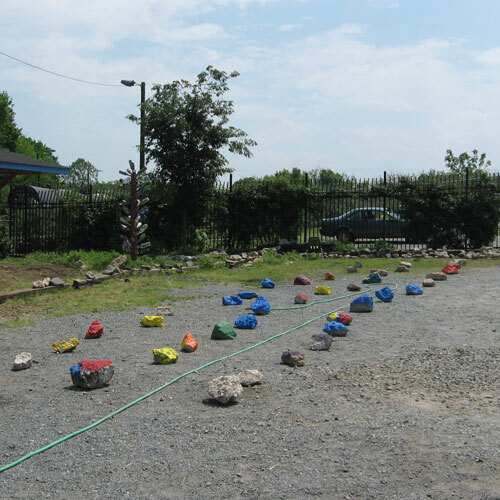 Not only did they dig and plant, they moved some of those big rubble stones to a place where we can paint them – recycling is our prime source of materials. After three years, we are finally fixing up the garden office and nursery/tool area. One area is a little usual – it is intended as a quiet space, a chapel if you like, for unprogrammed meditation and reflection. It’s tiny, but at least it is something. It will open into a garden area. Here is Donald, our lead craftsman working on the project. He and his crew, which includes his dad, have done a terrific job on the renovations throughout the station building. Here’s a look back into the tools area from the outside work space. We’ll be able to do potting outside on tables under the shelter of the roof over the landing, where passengers used to wait to catch the passenger train. This space used to be a pantry when everything at the Center was housed in this structure, from soup kitchen to counseling. Now, it should become an ideal garden growing center. Though it’s hard to imagine, this is the outside of the chapel area. We will be creating our own ‘people’s stained glass’ for the chapel – think a very small shrine of a Greek island. Our target for completing the area, at least provisionally so we can use it, is April 1. Sad news this week. Mae is gone. She was found dead in her camp this weekend, no sign of foul play. Of part First Nations heritage, Mae brought a quiet dignity to all she did. No often, but sometimes, she’d help in the garden, but she liked to hang out on the edge of things. We talked a little about the medicine wheel out front, which she found both inspiring and funny. Now, she returns to the ancestors, and to the soil that once belonged to her people. Here, Cleo rearranges the stone cross that somehow has ended up in the center of our Medicine Wheel. But our stories and symbols are our medicine now, no diminishing their power with appeals to reason or observation. But this wheel is oriented, at least, to the main directions, so you can find your way at least to the north, south, east or west. In our courtyard, the rubble and improvised art bring a sense of us all being in this together, from the transcendent and almighty to the mundane and struggling. There are constant parades in and out the back gate – Lite and his pack of hounds, a volunteer and his sons marching down to load up on compost to bring to the garden up the hill. Tatiana’s paintings grow more secure, the colors and shapes surer, even as neighbors relax nearby, curious but without much to say directly. It is almost as if the painting and the creative process give off a glow, like a log fire late at night on a camping trip . Our weather is mild in the daytime, though things are still dry it has been raining a little bit, too. But the nights are cold, so when they come through the gate, people are very tired. So they sit quietly and nap beside the bottle tree, in the afternoon. Closing again of a sweet note, here is another view of the community singing three weeks ago. 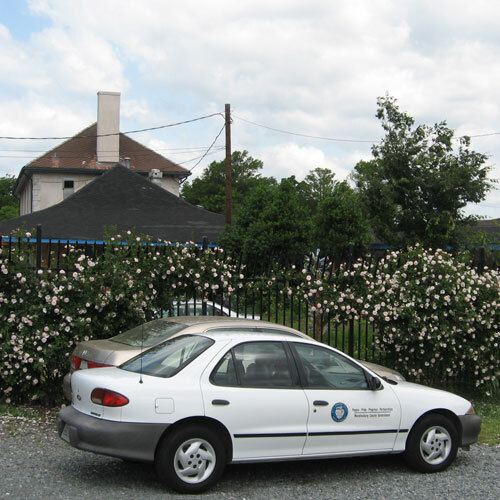 Don Boekelheide blogs this site and gardens with the neighbors at the Urban Ministry Center.